License to sell Ayurvedic medicine in India: - Ayush Mantralaya Said applicant doesn’t need any type of license by giving it example of Hindu Religious Text Book of Patanjali who is god of Ayurvedic Products. Ministry said selling Ayush product only requires good experience, Current Analytical Subjects with real Practical Knowledge of Ayurvedic Cure. For opening of Ayurvedic store: - In India Minimum 16,000 Crore Medicine Market of Ayurvedic Medicine and also estimated to cross Rs 52,000 Crore in 2020. 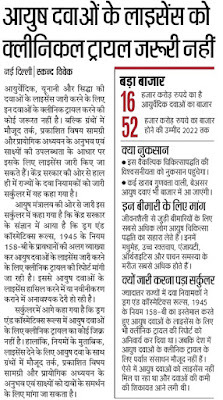 In the direction of Under Drug and Chemist Rules 158-B of 1945 Ayush Mantralaya has published circular rules which say separate license Ayush Medicine but it resulted to late issue of Ayush Medicine Lincence, Renewal from government department. Ayurvedic Drug License Registration 2018:- Ayush Department of Ayurvedic Medicine department said we will revise the circular rule of Drugs and Chemist rules and also reviewing the Text of Ayush Medicine used presented Ayurvedic Text Books. Important Ayurvedic Medicine Used in this important disease which are now come in India and World. These are High Blood Pressure, Diabetes, Arthritis, Enjoy tee, Stomach Digestive Problem etc. (I)Raw materials used in the producing of drugs are authentic, of prescribed quality And are free from contamination. (II) The production process is as has been prescribed to maintain the standards. (III) Good measure of quality control measures are adopted. 1. I/We ……………of …………hereby apply forthe grant /Renewal of a license to manufacture Ayurvedic (including Siddha) or Unani drugs on the premises situated at ………………. 2. Name of the drugs to be manufactured (with details). 3. Names, qualification and experience of technical staff employed for manufacture and testing of Ayurvedic (including Siddha ) or Unani drugs ………………. 4.A fee of rupees………………. has been credited to the Government under the head of account…….. And the relevant Treasury Challan is enclosed herewith. Note: The application should be accompanied by a plan of the premises. 2. 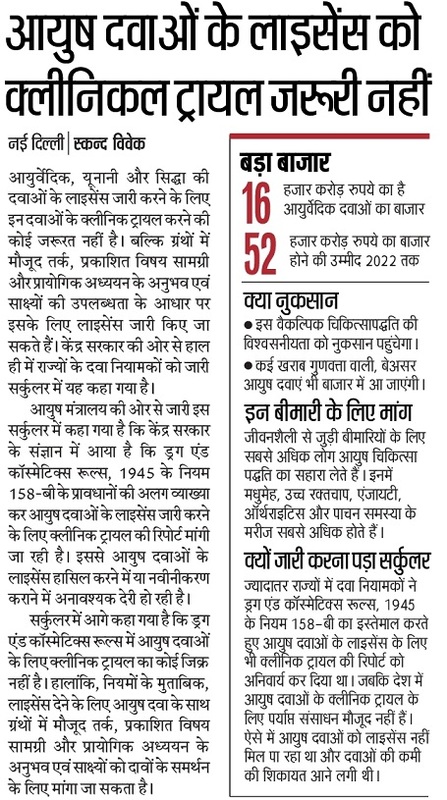 Name of drugs to be manufactured (with details). 3. Names, qualification and experience of technical staff actually connected with the manufacture and testing of Ayurvedic (including Siddha ) or Unani drugs in the manufacturing premises. Manufacturing capacity is intended to be utilized by me/us. services of their competent technical staff, equipment and premises for the manufacture of each item required by me/us and that they shall maintain the registers of raw materials and finished product separately in this behalf. 5. A fee of Rs.………………. has been credited to the Government under the head of account………… and the relevant Treasury Challan is enclosed herewith Date………….. Signature (Applicant)………….